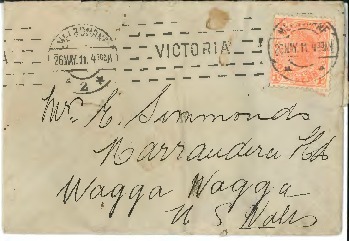 Letter from Mary to her mother Mrs E Simmons of Narrandera Road, Wagga Wagga. The letter mostly relates news about Mary's baby, Edward Charles Frances. There is also an invoice from David Copland and Co. to Mr WC Simmons regarding children's shoes. Simmons Family, David Copland and Co.
Simmons Family, David Copland and Co., “Simmons family correspondence,” CSU Regional Archives Digital Gallery, accessed April 26, 2019, https://csuregarch.intersect.org.au/items/show/1800.